An ancient town, both Roman and Carolingian, Genoa was a marine republic and queen of the Tyrrhenian until, along with the fall of Constantinople under the Turks (1453), this thriving colonial period came to an end. It regained its autonomy under the aristocratic government of Andrea Doria, who occupied it on behalf of Spain and guaranteed the town a regime of total independence. This was maintained, albeit with occasional changes, until the annexation to Savoy rule in the 19th century. Its most glorious historical periods are reflected in a historic centre of incomparable fascination. They authentically conserve not only monuments, but a cultural element which can be said to be genuinely "of the people". It is, in fact, a fine European example of a medieval city which has been almost entirely preserved. This is evident in the Ripa Maris, in the palaces of the "Via Aurea", amongst the hills of the Castello, focal point of the first settlement, and in the two thousand year old Commenda di Prè. The urban make-up of "vicoli" or alleys, from the Latin "quadrivium", intricate yet organised, gives the sensation of walking through history. Not to be missed, apart from a long walk around the alleys, is a visit to the Palazzo Ducale, seat of the government since 1200. The palace became known as "Ducale" when the first Doge, Simon Boccanegra, made it his seat of government in 1339, and from then on it became the residence of the Dogi. After undergoing numerous alterations, fires, restructuring, restorations and being destroyed several times, the palace was recently restored over a period of ten years. This authentic and characteristic heart of the town is now used for many different purposes and hosts the most prestigious cultural events from both the city and the surrounding area. 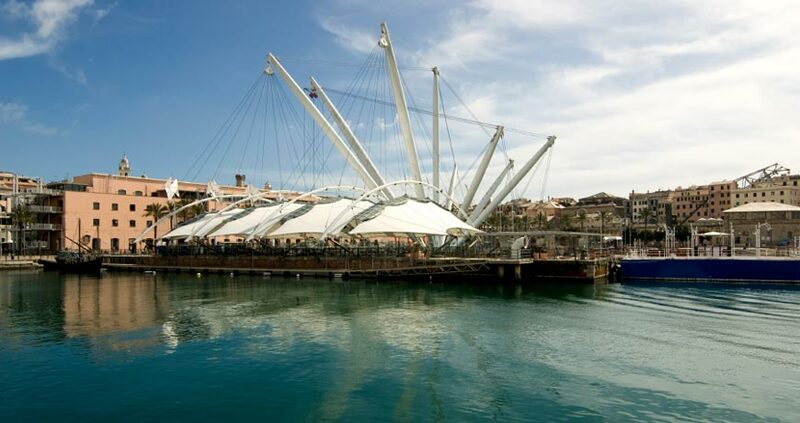 Apart from its magnificent historic centre, Genoa offers two attractions you don't even need to leave the city to visit. One of these is definitely the Lanterna, the lighthouse in the port. 117 metres above sea level, its light shines to a distance of 36 sea miles and it is one of the oldest lighthouses still in use. The other visit, again linked to marine life, is to the Aquarium. It is the largest in Europe and is an important point of reference for both the city and the scientific world. Inside an environment which has been faithfully reconstructed and which covers a surface of 10.000 square metres, you can see over 600 different aquatic species. The Aquarium represents an enthralling journey across the oceans, starting with the origins of life and arriving at current issues regarding the protection of ecosystems. A surprise lies at every corner: it is as if you are immersed in seas all over the world, on a journey to discover their hidden mysteries. There are many traditional events to be found in a town so glorious in its history. During Holy Week, the week before Easter, there are the processions of the Casacce and of the sepulchres, along with religious theatrical performances across the town. Still in Spring, the Regata delle Repubbliche Marinare takes place every four years. This spectacular boat race involves the four towns of the old Marine Republic, Amalfi, Genoa, Pisa and Venice. These cities host the event in rotation, hence in Genoa the event takes place every four years. Each town has its own team with oarsmen dressed in costume according to the colours of their respective Republic. At the same time, there is the procession of the Grande Corteo Storico, which recalls important events from the four towns. Dear User, this website uses profiling cookies owned by us and by third-party websites in order to send you advertising messages in line with your preferences. If you would like to learn more about this or refuse to give consent to all or some cookies, please click here.